The hall presents the image of “Dome-like Heaven and the vast Earth” through the dome, round pillars and the square platform. 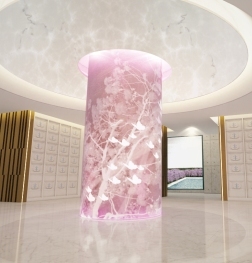 The elements of outdoor landscaping are also introduced in the indoor landscaping; through the laser carved backlight, the image of “dancing cherry blossoms” is implemented. 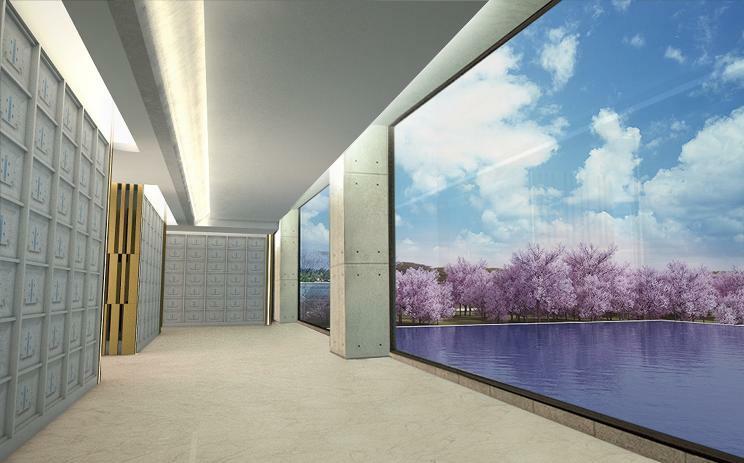 Moreover, VIP ROOM has a fabulous vision which allows people to appreciate the waterfall and cherry blossoms closely. Inside the hall, the low-key landscaping of wall fully presents private and honored demeanor of eternal mansion and isolates bustles and hustles. With dancing cherry blossoms and the water curtain reflecting green mountains, Hall of Eternal Sleep combines with nature and builds a leisure pure land as plants grow in changing four seasons. More surprisingly, Heinrich Wang, an art master, personally designs novel panels which integrate class and fashionable sense; in addition, the flexible wide interior space makes the design even exceptional. The principle of design for the space is based on geometric circles, creating an intriguing bright appearance and wide and comfortable space; with functional installation art as well as lighting and projection, the space demonstrates rich and multi-layer phenomena. Besides the luxurious and comfortable interior layout, the spacious embedded frames of boxes even boast the applicability. The design and wide space are perfect for urns and flexible capacity also allows family members to adjust and use it freely and brings them convenience. Colorful panels with cross-field design; exclusively selected by Japanese royalty, Okura Art China, the brand of classic royal china follows the spirit of Master Ando to create a world of colorfulness. 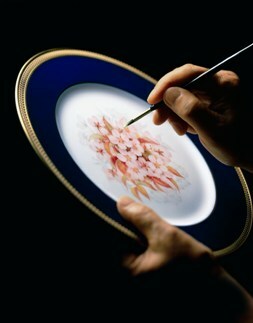 Okura Art China insists in exclusive customization and limited production; it adopts SW-class (special white-class) “ka-o-lin” with self-invented techniques and successfully achieves the maximum temperature of 1460 degree for china production, creating a leading “OKRUAWHITE” in the world. After the architectural design of Tadao Ando, Lungyen Group once gathers elites from various fields to establish the hall of honor for premium clients. Jointly reinterpreted by Chengjian, the subsidiary of Eslite Group, the leading company in cultural creation industry in Taiwan, and J.M.Lin Architect, Palace of the Light is not only a heaven of art, but also a hall of cultural creation. The indoor space is not an independent unit; it constitutes a brilliant aspect of architectural decoration and even can be used to reflect changes of outdoor environment; when the space and nature integrate into one, we can wander freely between nature and human culture. 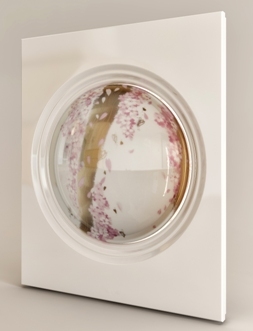 Designers apply technology to space and create changing seasons, rain, dancing butterflies, and flying cherry blossoms, all of which present the co-existence of all creatures and resemble a picturesque painting. People enter such fairyland and feel natural atmosphere with butterflies resting on people’s finger tips, which fly to the world of eternity with memories of ancestors. The house implements the intelligent cloud management of premium mansion. Through the combination of APP (mobile application), VIP may enjoy more considerate service. By the data input of system, clients can use exclusive APP to record related information in the future, and family members do not have to worry about keys anymore. Moreover, related information regarding worship, festivals and assembly may be notified through APP text message. With this technology, we can complete clients’ needs shortly and bring a more instant and considerate service. Wood and stone are materials with life and bring vitality to space. The architectural master Tadao Ando respects the environmental ecology and pursues the co-existence of architecture and the environment. He introduces cherry blossoms of praising life indoors to be Heaven and natural stones of bearing all creatures to be Earth, making the indoor space resemble vital nature. Spacious exclusive rooms with well-designed scenic chairs allow the deceased to observe aura at the dome and seem to live space which God protects. 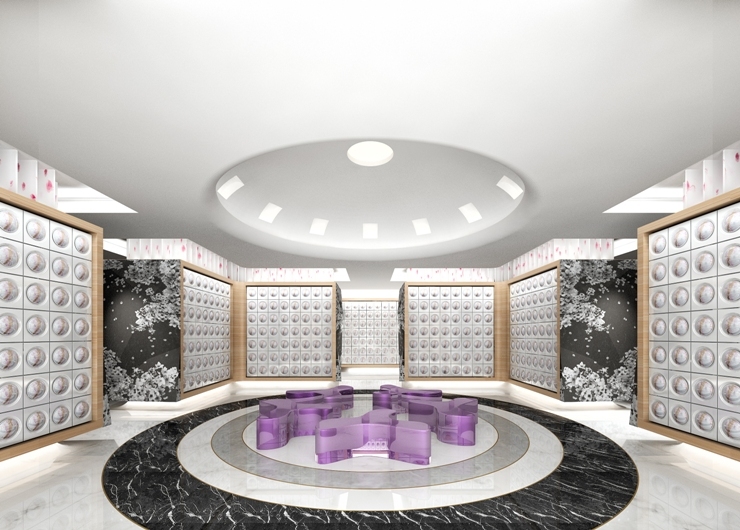 The exclusive ritual at the entrance makes memories enter the world of eternity. The life transforms into dancing butterflies with leisure and delight. The pile of colorful butterflies indicates the seemingly true life of brilliance. Instantly dancing hundreds of thousands of butterflies touch hearts of visitors and cultivate their expectations of future world. 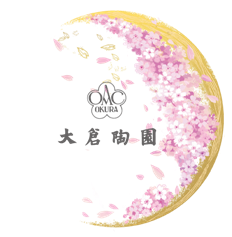 The lifespan of each cherry blossom is like ours. When gradually brightening sunlight reflects changes of dawn and spring of life-like drizzle cultivates sprouts, which absorb natural essence and grow into flourishing cherry blossoms. With dancing butterflies and flowing water around, people may enjoy and immerse themselves in the colorful brilliance of life and feel time of universe and rhythm of life. Life evolves in space naturally and forms a universe-like harmonious and vital transmigration. The exclusive rest area for VIP contains scenic seats which are designed with natural elements and resting functions. When people missing their ancestors, they may immerse themselves in such artistic space and anticipate the brand-new journey in the world of happiness.